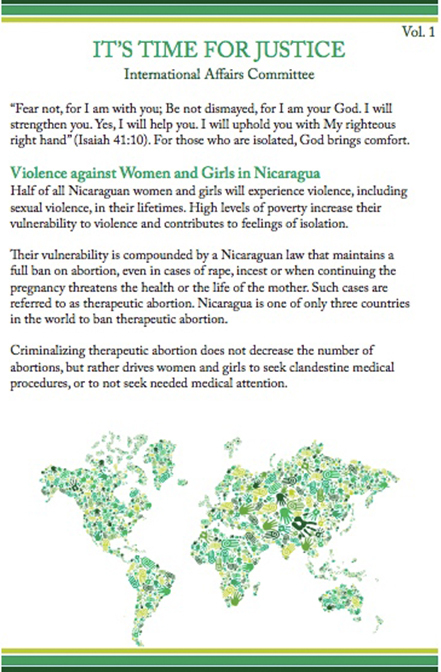 Four new bulletin inserts from the International Affairs Committee draw attention to the violence against women and girls in Nicaragua, the plight of the Rohingya, an ethnic group in Myanmar considered by the government to be illegal foreigners, the Treaty on the Prohibition of Nuclear Weapons and the Arms Trade Treaty. Use the bulletin inserts to raise awareness of these urgent issues. 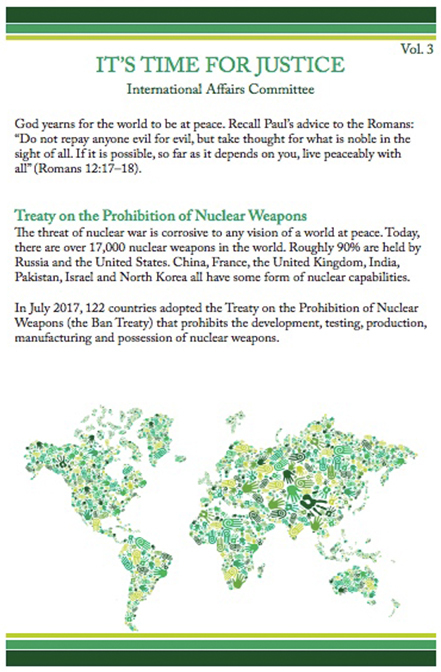 Each bulletin includes a Bible passage, overview of the situation, what the PCC is doing in response and a prayer. To order print copies, call 1-800-619-7301 ext. 331 or use the online order form (under Justice). “Fear not, for I am with you; Be not dismayed, for I am your God. I will strengthen you. Yes, I will help you. I will uphold you with My righteous right hand”(Isaiah 41:10). For those who are isolated, God brings comfort. Half of all Nicaraguan women and girls will experience violence, including sexual violence, in their lifetimes. High levels of poverty increase their vulnerability to violence and contribute to feelings of isolation. “When a foreigner resides among you in your land, do not mistreat them. The foreigner residing among you must be treated as your native-born. Love them as yourself, for you were foreigners in Egypt. I am the Lord your God” (Leviticus 19:33–34). Jesus reminds us, “in everything do to others as you would have them do to you; for this is the law and the prophets”(Matthew 7:12). The Rohingya are an ethnic group who have lived for centuries in the western coastal region of Myanmar in what is now Rakhine state. 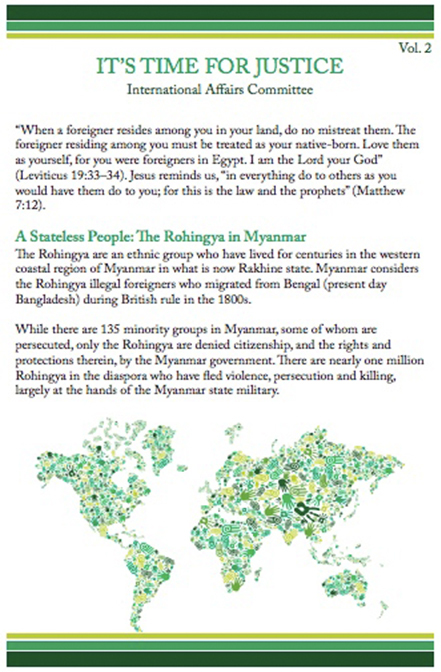 Myanmar considers the Rohingya illegal foreigners who migrated from Bengal (present-day Bangladesh) during British rule in the 1800s. God yearns for the world to be at peace. Recall Paul’s advice to the Romans: “Do not repay anyone evil for evil, but take thought for what is noble in the sight of all. If it is possible, so far as it depends on you, live peaceably with all”(Romans 12:17–18). The threat of nuclear war is corrosive to any vision of a world at peace. Today, there are over 17,000 nuclear weapons in the world. Roughly 90% are held by Russia and the United States. China, France, the United Kingdom, India, Pakistan, Israel and North Korea all have some form of nuclear capabilities. The Prophet Micah dreamed of peace, where people “beat their swords into ploughshares, and their spears into pruning-hooks.” He proclaimed God’s world should be safe and secure, that “no one shall make them afraid”(Micah 4: 3–4). 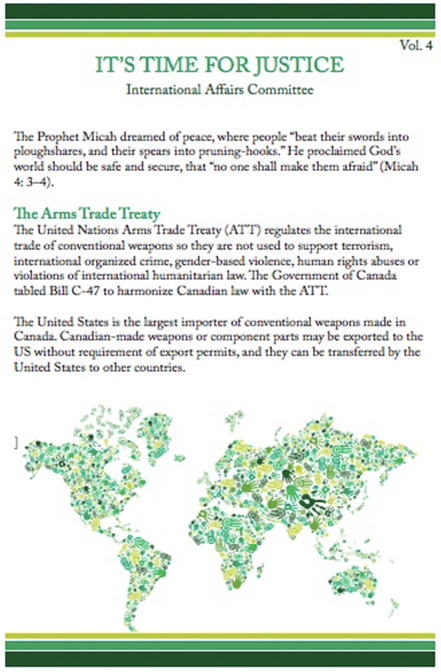 The United Nations Arms Trade Treaty (ATT) regulates the international trade of conventional weapons so they are not used to support terrorism, international organized crime, gender-based violence, human rights abuses or violations of international humanitarian law. The Government of Canada tabled Bill C-47 to harmonize Canadian law with the ATT.